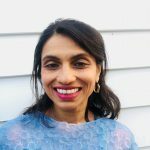 Anu is a writer and theatre practitioner. Her work includes: Waterfall (Ashfield Theatre Croydon -Pick of the Week in Time Out), The Ecstasy, (Oval House Theatre), London Fields (rehearsed reading by Kali at Soho Theatre), Awaking Durga (Soho Theatre), TWELVE, a commissioned piece that was part of Kali’s Honour Killings project. She is currently working on her digital interactive theatre project for the sensory impaired ‘Sensorinet‘. Anu has been making work for theatre since age 14 including original student productions, Edinburgh Festivals and one-off projects. She continues to write for theatre, work with dancers and musicians and train in yoga. Anu is a practising GP in Hackney.